Alan Bleasdale returns to British TV for the first time in a decade with a new two part drama for BBC Two. The Sinking of The Laconia tells the story of the torpedoing of a converted liner the RMS Laconia in 1942. The ship, travelling from Egypt to Britain, was sunk by German U-boat 156 commanded by Werner Hartenstein. The U-boat surfaced to pick up survivors - against the orders of Nazi High Command - and over the next few days saved 400 people. Lindsay Duncan, Andrew Buchan, Brian Cox and Franka Potente all star in the programme. Bleasdale, who hasn't written for the BBC since the 1980s, has been working on the project for over six years, "It's kind of scorched into my mind; it was 4 October, 2004 and I met Jonathan Young [producer] and Peter Fincham in London," he said. "It was their idea, but I fell in love with the story. They sent me a few books and I became fascinated by the central character of Hartenstein. "We all grow up with classic clichés about the Germans and about the Nazis and clichés are often clichés because they happen to be true. But in this case what I saw was the most remarkable and wonderful act of generosity." Many of the crew came from Bleasdale's home town but he says he hadn't really heard of the incident before working on the drama, "As is fairly obvious I come from Liverpool and an awful lot of the merchant seamen were from Merseyside. "I've lived in Liverpool all my life, yet the Laconia incident was not anything that I really knew about. "When people heard I was going to write about it, then occasionally you'd get someone who'd say, "Oh yeah my uncle was on that," but it was never talked about. "Why? 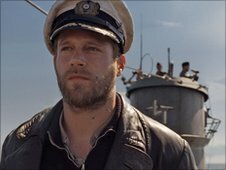 My suspicion is that the Germans didn't want, in their Nazi pride and their brutality and violence, to suggest to the Allies that any German sailor might be a man of generosity and spirit. U-156 sank the Laconia on 12 September, 1942. "I also think that on the Allied side there were monumental mistakes made - the Italians, for example, know of the Laconia incident as a war crime. "Hundreds of their PoWs were shot as the ship went down - and so the Allies didn't want this to be revealed as a mess-up. "I think that's one of the reasons why I didn't know about this story until 4 October 2004. "But when I heard about it I just thought that I would do almost anything to write this." Hartenstein crammed 200 people on board the submarine at surface-level and another 200 in lifeboats. He gave orders for messages to be sent to the Allies to organise rescue for the survivors, however they were spotted by an American B-24 bomber who attacked the survivors. The Laconia was carrying 2,725 passengers: 463 officers and crew, 286 British military personnel, 103 Polish Guards, 80 civilians - mainly women and children - and 1,793 Italian prisoners of war. 1,621 died while 1,104 survived the incident. Bleasdale says he researched all sides of the story throughly, "I've never spent so long and worked in such detail on a piece like this: you can see it in the scale of the production. "I must have read, and I'm not exaggerating, 30-35 books that have come out. What was fascinating was that none of them had that Nazi philosophy that we all knew and suffered from, throughout them. "Some of the German production teams thought that, for example, I was too kind to figures like Admiral Doenitz, who they only know as war criminals, but the books stand it up. "Inevitably, because it is drama you try to bring it down to the essence, particularly when you're trying to tell a story this complex and this big. And the essence is Hartenstein. "I was always completely in love with the character of Hartenstein. What he represented was what we all believe and hope that humanity might be." 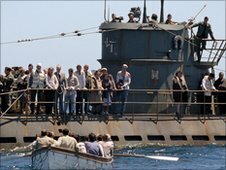 The Sinking of the Laconia is on BBC Two at 2100GMT, Thursday 6 January, 2011.